Having the right Ethernet switch can make your network speeds improve drastically. But before we get into that, let’s first understand what an Ethernet switch does. An Ethernet Switch is essentially an extension device which allows you to hook up more devices to your network than what your router would allow. Basically, it’s a clever gadget that increases the number of ports you have that you can connect your devices to. For example, let’s suppose that you have many computers at your house that you want to hook up to your network but your router has only 3 Ethernet ports that you’ve already used to hooked up your computers or maybe a printer. What an Ethernet switch can do for you here is to connect one port to your router while the rest of the ports outfitted into the switch will split that connection to give you more hook ups. That’s basically the long and short of it. It’s simple to use and very effective in managing your network speeds. There are many sizes of switches available in the market with a varying number of ports ranging from 5 to 10, 12, 24 and anywhere up to even 64 ports. 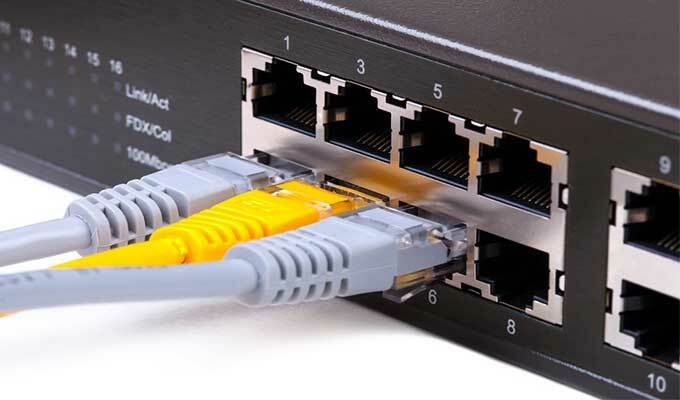 Before you can start looking for an Ethernet switch that works for you, you should have a little background about how Ethernet switches can have an impact on speeds. Most Ethernet switches manage their network speeds in terms of packet delivery and in case you’re wondering what that is; a packet is basically a single unit of data that is transferred from its location on the internet to its destination. To make things simpler, when you’re downloading something from the web, you’re receiving it in packets. Incidentally, some switches can also store these packets on board and filter them for errors before forwarding them to your device. Again, there are many kinds of Ethernet switches from just as many brands available on the market. Now without further ado, let’s check them out, shall we? 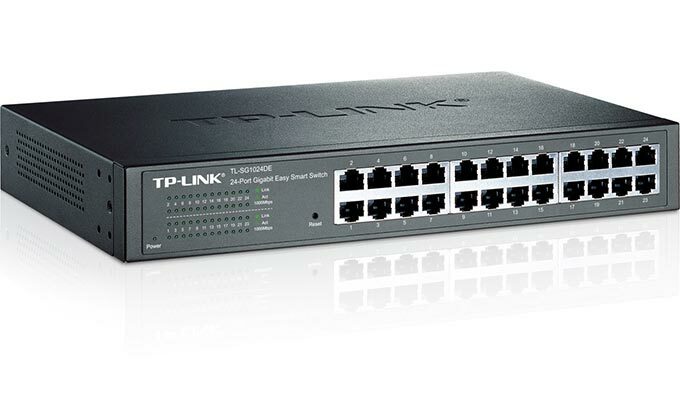 The first Ethernet switch on our list is the TP-LINK 48-Port Gigabit Ethernet Rackmount Switch (TL-SG1048). Now this is definitely one of the hotcakes among Gigabit Ethernet switches in the market currently. The TL-SG1048 can handle pretty much anything you throw at it. Naturally, this includes VLANs and Port Aggregation. 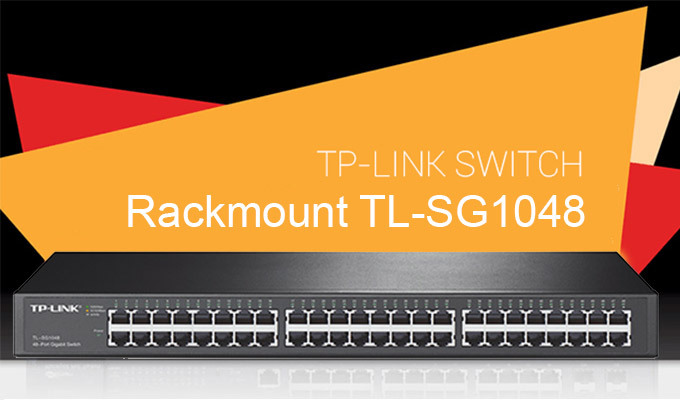 The TL-SG1048 is what you call a managed switch. For those of you who do not know what this is, this basically means that this switch can be programmed with the help of the utility tool it comes with, however, a physical console from where you can manage the settings is absent. Another neat little feature that we found to be very useful is the on board ‘Cable Test’ which allows the TL-SG1048 to diagnose your Ethernet cables for you and let you know if your cables are faulty in some way. Now usually these kinds of features are marketing gimmicks from the retailer however, with the TL-SG1048 we were able to diagnose a few bad cables so it’s safe to say that this feature works. More importantly, we found that the TL-SG1048 runs great and faced no issues with the speed, as you would expect from a gigabit switch. The speed test results through the switch were the same as when we connected our devices directly to the server. The only real drawback that we noticed with the TL-SG1048 was the fact that despite being a managed switch, the TL-SG1048 is not exactly what you would call ‘web smart’. What this means is that is does not support a web based management interface and if you want to make any changes in the configuration, you’ll have to use the utility tool that comes with the switch. The tool works just fine but other TP-Link models such as the TL-SG1016DE and TL-SG1024DE could be managed through a web browser, which makes you wonder why they forgot to include this feature on the TL-SG1048 as well. Over all, this is a great switch and well worth the price. It’s more power efficient than most other switches and a good purchasing option if you want something a little advanced for your home or business network, 48 ports flexibility is no joke after all. For many years now, Netgear has established itself as one of the leading names in providing Network Solutions. 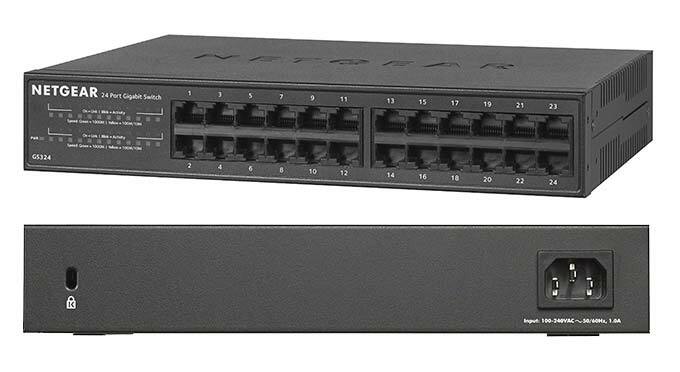 The next Ethernet Switch we’re looking at is the NETGEAR’s ProSAFE JGS524E 24-Port Gigabit Rackmount Switch (JGS524Ev2). Let’s start looking into whether or not this switch upholds Netgear’s legacy as an authority in providing network solutions. At a glance, the JGS524Ev2 looks robust and promising thanks to its unique narrow design and metal finish. However, the JGS524Ev2 is somewhat of a budget device but it still manages to deliver and doesn’t trouble you with any auto-negotiation problems or drops in speed. After all, as a gigabit switch, if the JGS524Ev2’s ports didn’t deliver the kind of speed you can expect from it, it’ll pretty much be a failure of a switch. We noticed some visual similarities between the JGS524Ev2 and other Netgear models such as the GS605, however you’ll be glad to know that the JGS524Ev2 is easily superior to the GS605 in terms of speed. The long length of this switch makes it more suitable to rack mounting instead of placing it on top of your desktop. One flaw that we noticed with the JGS524Ev2 is that it has this tendency to overheat sometimes when being run on full capacity, Otherwise it’s a good device to buy if you’re on a budget. 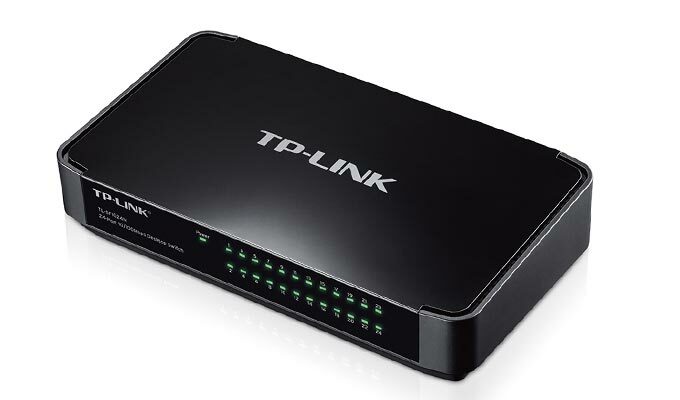 The switch we’re taking a look at next is the TP-LINK 8-Port Gigabit Ethernet Desktop Switch (TL-SG1008D). Not all Ethernet switches are made to manage a ton of devices at large networks. 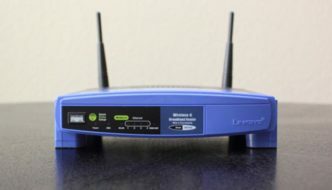 If you’re looking for something that simply allows you to connect more devices that you can using your router’s Ethernet ports at home, the TL-SG1008D pretty much fits your bill. This switch is the very embodiment of simple and effective. It’s small and modest in design with LED lights on the front and 8 ports on the back, two of which have Gigabit capabilities. The main benefit of the TL-SG1008D is that it is very cheap to buy, making it a very good option for personal use in your home or small office environments. The TL-SG1008D is an unmanaged switch but in all honesty, we believe that there are really no configurations that you may want to tamper with on the TL-SG1008D. It is a plug and play switch that gets the job done and is good at it. One notable feature of the TL-SG1008D that we really liked was it’s built in power saving mode; this means that when one of your connected devices is on idle or is powered off, the TL-SG1008D doesn’t communicate with that device, saving some energy. The only thing that we weren’t too enthusiastic about regarding the TL-SG1008D is the fact that the switch is designed in such a way that having it placed vertically can prove to be troublesome. However, this shouldn’t pose too much of a problem in placing the switch as it has a good grip on any desk and also has wall mounting options. Another thing worth mentioning is that the TL-SG1008D doesn’t come with an Ethernet cable out of the box, which is understandable considering the low price are going to spend on it. Next up, we’re going to be talking about the TL-SG1024DE from TP-Link. To those who are wondering if this switch is the 24 port variant of the previously discussed TL-SG1008D, the answer is yes, and no. The TL-SG1024DE is a totally different class of gigabit switches. Putting the 24 ports aside, this switch is managed and offers many more features and at a very reasonable price of around 120 dollars. The TL-SG1024DE fared very well on our speed tests and was able to communicate soundly with 23 devices connected to its ports without producing too much sound or heat. It is safe to say that the TL-SG1024DE can handle the job you bought it for. The packet forward rate is a solid 37.5Mbps. Making this switch one that is both easy to use and effective, like a switch should be. However, the TL-SG1024DE isn’t exactly a looker or anything close to being decorative, it is a device that does its job. You will be better off mounting it to a wall and out of sight rather than on your desktop unless you like having a large hefty device whizzing away at your desktop while you work. But other than the form factor, this switch is a device that will work wonders for anyone looking for an advanced networking tool. TP Link has remained a major player in the networking industry for a long time now and till now, everything that they’ve brought to the table in this list has lived up to our expectations if not exceeded them. The 16-Port TL-SG1016D is no exception to this trend and proven itself to be a very straightforward device that can connect up to 15 of your devices at a time and not compromise the speeds to any. Like the SG1008D we discussed earlier, the TL-SG1016D is an unmanaged switch that gets away with being so thanks to its plug and play simplicity which makes it a breeze to use for even those of us who aren’t very tech savvy. The TL-SG1016D is well ventilated and didn’t heat up even after being connected at every port for a number of hours during our tests. It’s safe to say that the TL-SG1016D is a very simple and straightforward Ethernet switch that is well suited for use in office environments as well as at home for activities such as LAN gaming. One thing worth mentioning is that the TL-SG1016D doesn’t come factory fitted with rubber feet for placement on a desktop, however TP-Link was nice enough to leave cavities for the feet. You’re more likely to mount the switch on a wall using the brackets anyway. 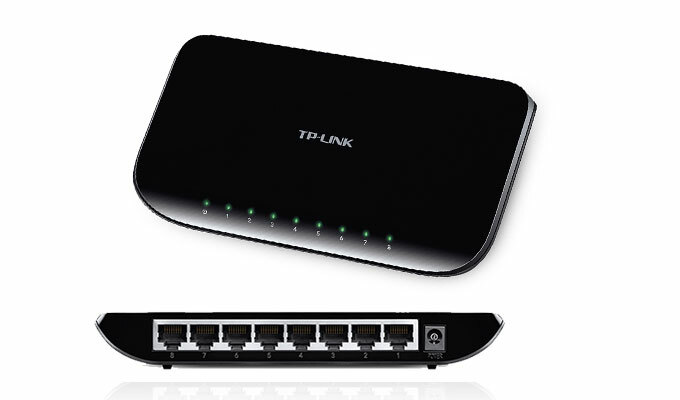 The next switch we’re looking at is the TP-LINK 24-Port Fast Ethernet Desktop Switch (TL-SF1024M). For those who are looking for a modest, and easy to use switch that can get the job done, the TL-SF1024M is a popular choice. The reason why that is so has a lot to do with the incredibly cheap price of this 24 port device. Since the TL-SF1024M is unmanaged, there are no ventilation fans needed to keep it at a steady temperature, all one really has to do with this switch is to plug it in and start using. For those who are conscious about the electricity used, you’ll be glad to know that the TL-SF1024M uses green Ethernet technology and showed remarkable energy saving during our tests. Overall, it runs great and despite being the modest device it is, the TL-SF1024M is actually not a bad looking device and is very lightweight too thanks to its plastic casing. We can’t think of why anyone would complain about placing it on their desktops. There is really not much to complain about with the TL-SF1024M given what it offers for the price however, if you’re looking for a switch that allows you to configure settings such as your mac address or VLANs, maybe you should consider a managed switch instead. Next up is the NETGEAR ProSAFE GS116E 16-Port Gigabit Desktop Web Managed (Plus) Switch. At a glance, the GS116E boasts a very sleek design in a metal body. We found it to be very Premium feeling. However, we aren’t here to talk about looks alone now are we? The GS116E proved itself by being able to deliver a steady 2000 Mbps of bandwidth to each port and having a frame support of up to 9KB packet sizes. Suffice to say that the GS116E is a switch that delivers in terms of performance. The fact that the GS116E is a web managed switch is good news to those who are looking for advanced options such as being able to monitor and control the traffic through segmenting your network. There are also a number of troubleshooting options that we found to be very useful in cases of common errors. However, it is worth mentioning that the GS116E pays the price for its fancy sleek design that causes it to heat up due to ventilation issues. However, if you place the switch in a well ventilated area, you could somewhat counter this issue. Otherwise the GS116E is a solid switch that does come across as a bit pricey for a 16 port switch but it out performs many of the cheaper alternatives. The TP-LINK 24-Port Gigabit Ethernet Rackmount Switch (TL-SG1024) is another unmanaged Ethernet switch from TP-Link. The first thing about this switch that would catch the eye of anyone who’s looking for Ethernet switches is the price tag of this particular 24 port switch which is more than twice as much as the TL-SF1024M that we looked at earlier. They’re both 24 Port Unmanaged switches from the same network giant so really, what gives? Well first of all, the TL-SG1024 is a gigabit switch capable of distributing a steady 1000 Mbps of broadband to all the devices connected to its ports. This makes the TL-SG1024 more suited to users who are looking for a means to connect a large number of devices without compromising the speeds. It’s a solid device that delivers and boasts a plug and play configuration that makes it easy to use however, despite being unmanaged, you’ll be glad to know that the TL-SG1024 supports MAC address auto learning and has an ability to store and forward data packets so you don’t have to worry about errors being communicated. Overall, we were happy with the performance of the TL-SG1024. However, if your internet connection is a standard 100 Mbps connection that you don’t plan on upgrading any time soon, you can save yourself a lot of money and get the more modest TL-SF1024M instead. The next switch on our list is the last that we will be discussing from the ProSAFE series from Netgear. Now, we’ve had a lot of Ethernet Switches coming in for reviewing but it’s safe to say that this one is by far the most powerful one in terms of broadband speeds. With 10 Gigabits of broadband distributed to each port on board the switch, the XS712T-100NES is a device that is suited to hard-core users and is perfect for tasks such as virtualization. The XS712T-100NES features a web management GUI which is by far the easiest one we’ve used on a managed switch. It’s safe to say that the XS712T-100NES does justice to its title as a ‘smart managed switch’ and it also features the most comprehensive list of networking features that we have seen on this list thus far. Overall we were very impressed by the high speed connection speeds and the general performance of the XS712T-100NES and think that it’s worth its hefty price tag of $1500 as an entry level business class switch. However, one thing that we wish that we could change about this switch is the amount of noise it makes. The fans needed to cool the device spin at high RPM and can be a bit noisy. If you’re used to working in a quiet office then this may bother you. Finally, we arrive at the last Switch on our list, the 24-Port Gigabit Ethernet Desktop/Rackmount Switch (GS324) from NETGEAR. Now without wasting anymore time, let’s get right down to it. The GS324 is compact, easy to use and affordable. It is an unmanaged switch that’s mostly aimed at users in small offices from what we’ve seen. It connects to all the devices just fine and we saw no interruptions or faced any problems using it during our tests. The metal housing of the GS324 is very robust and well ventilated as compared to the GS116E we spoke of earlier. The lack of fans also make it a very silent device that is ideal for use on a workplace. Overall, the GS324 is a device that doesn’t disappoint and is reasonably priced as well. However, if you’re a more tech savvy user, you probably would want to invest more and get yourself a switch with QoS and VLANS capabilities, otherwise this is a good device that anyone who needs to connect more devices to their Network would be happy to have. Now that we’re at the end of our list, let’s have a quick word to sum up. There are many Switches out there that you can buy and by now you should have a fair idea about the kinds of features that you would want on board a switch that you could use for networking. Ultimately, you should go for a switch that has more ports than the number of devices you own and you should also take into consideration the stability by which the switch distributes speeds to your devices.